Way back in the day, when I first created the website Go Dairy Free, there were just a few fledgling special diet companies out there. One of the first ones I made contact with was Gak’s Snacks. Jill, the mother of a child with multiple food allergies, created a peanut-free, tree nut-free, egg-free, dairy-free bakery (also vegan and organic) that churned out the most delicious coffee cakes and cookies under the Gak’s Snacks label. But Jill’s once little company has grown since I first met her … and with that growth, she decided they needed a new identity. So Gak’s Snacks became HomeFree Treats. While I admit to missing the old name, I am elated that Jill hasn’t changed a thing about her products, aside from adding some new ones! Trust me, everyone will want these (just ask Sarah), they aren’t simply for the food allergic (yes, even if you can eat everything under the sun, you can, AND SHOULD enter to win this giveaway). 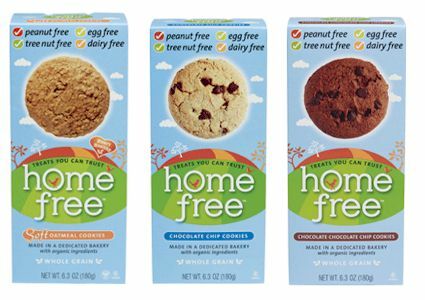 Enter to win Organic Cookies from HomeFree Treats! Leave a comment on this post, and let me know what flavor of cookie you think Jill at HomeFree should come up with next. No ideas? That’s okay, just tell me why you want these cookies! For a second entry, twitter and/or blog about this giveaway, making sure to link back to this post. The winner will be selected on Friday, May 9th, so get your comment in before then. Good luck! Win coupons for the new Soy-free and Dairy-free “Butter” from Earth Balance on The Allergic Kid. Ricki at Diet Dessert and Dogs is giving away copies of her new cookbook, Sweet Freedom! a. a sinfully delicious but guilt free good old fashioned sugar cookie. banana with peanut butter chips….. heaven in a cookie!!! I love these cookies. I am thinking sunbutter. I have made cookies with sunflower seed butter instead of peanut butter and they are delicious. And they’d still be pn and tn free. Yum! I’m crazy for soft molasses cookies- good ones are hard to find, too. I like the offerings they have so far. Hmmm? What else? Lemon (as someone already suggested) would be yum maybe with dried cranberries! 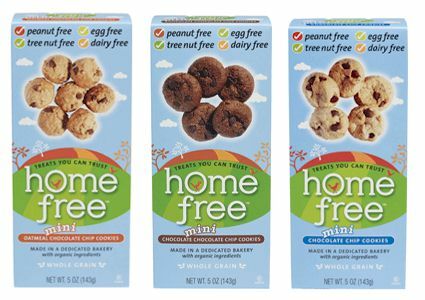 Is HomeFree wanting to manufacture without the use of nuts? Peanut butter would be nice to see but if they are trying to avoid common allergens then maybe this isn’t such a prudent suggestion. My partner has Celiac’s we are FOREVAH trying to find good yummy treats that are GF. I will look for this brand. It’s a struggle to find good, ***organic***, yummy snacks. Thank you HomeFree! How about a coconut mocha chip cookie. I think a snicker cookie would be delish! How about a chocolate-mint cookie? i’ve seen these but never tried them! i’d say peanut butter, but that wouldn’t quite be allergen free 🙂 how about one with coconut? I like Snickerdoodles. Thanks for the giveaway. I’d love the chocolate chocolate chip cookies. A toffee cookie would be yummy. I’d love to see a peanut butter cookie with chocolate chips. oh my goodness!!!! well since these are peanut free cookies.. i will go with- sunbutter with chocolate chunks! but i really would like the cookies because my boy is struggling.. coping with the fact he cant eat dairy anymore! he would love to try these! Ooo! These look sooo yummy! Would you beg Jill to please come up with a Snickerdoodle? After chocolate chip fresh out of the oven, ‘doodles are my absolute favorite cookie. I want the snickerdoodles!! Yumo! I think a lemon, orange or any citrus flavored cookie might be interesting. Another idea is to have a mint and chocolate flavor. I also just twittered about this amazing brand at @lindaole! I want to win so the prize can be shipped straight to my son, who is off at college. It’s fun to get packages like this when you live in the dorms! I’d like to see a chocolate cookie with fruit in it. Maybe coconut, or orange, or cranberries? Chocolate goes with just about anything so any fruit will do! Thanks for this contest. Mmmm! These look good! I agree with snickerdoodles… and even an oatmeal choco chip! Love it! I say go for peanut butter next! Those are always my fav cookies! Its all about the snickerdoodles. Mmmmm. I want to win, because they look so delicious! Walnut & chocolate chips cookies are delicious!! Something with a fruit like cranberries! Something with pineapple and coconut – like a pina colada cookie! yum! A breakfast type cookie with granola and dried fruit would be great, so it could be a healthy breakfast/snack on-the-go as well as a delicious treat!